This article was published on http://www.cwn5.com in April. “Tessanne won the Voice!” That was what my wife screamed to me as the results from Season 5 of the American reality show, The Voice were announced. Tessanne Chin, the Jamaican reggae-rock fusion singer who produced the wonderful album In Between Worlds, had won. Wow! I thought to myself with an unmistakable uneasiness. Why worry? Well The Voice to me has proven to be, as we say in the Caribbean, a bit of a sweet talker and like most sweet talkers, their intentions are not always the best. is a televised, season-long music competition which involves singers blind auditioning for coaches. If the auditions go well then the contestants get to choose which of the coach’s teams they will join, in the hope of that coach helping them facilitate their dream of mesmerizing the viewing public and winning the competition. The benefits of winning this competition are obvious and since conquering on Season 5, Tessanne’s public profile has exploded globally. She has performed at the White House, courtesy of an invitation from the Obamas no less, signed to talent firm ICM, which deals with artists as from Al Jarreau to Pamela Anderson, and headlined more Caribbean festivals in the past year since winning The Voice than Sizzla and Machel Montano combined. In addition, she has an album coming out on Universal Republic Records with contributions from hit writers Toby Gad and Dianne Warren. The past winners of The Voice, and they have been a few now, have not gone on to garner much mainstream success. Unlike, American Idol, no one from The Voice — winners or otherwise — has managed to crack the Billboard pop charts. As Dave Holmes, television host and reality-TV recapper told The Daily Beast, “It’s like people win The X Factor or The Voice and enter the Witness Relocation Program.” Funny and true and only the ardent pop culture buffs can actually name all the winners from The Voice. royalties and publishing from sales of her album “In Between Worlds,” which was recorded long before her appearing on the Voice. a piece of all her non-musical earnings such as sponsorship deals and endorsements. After reading this I hope that you understand my concern. Hopefully however, it will work out for her financially and artistically, especially given the fact that her sister, Tami Chin Mitchell, who apparently has experience with the label machinery is joint managing her. So as a fan from her In Between World days with its monster track Hideaway, I wish her all the best. I sincerely hope that on this new journey the industry pitfalls will not consume her and she can buck the trend and prove there is indeed a musical pot of gold at the end of the Voice rainbow. This article was published on http://www.cwn5.com in April. 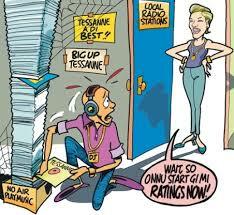 Since then Tessanne has released her debut album on the Universal label to a very lukewarm reception. See link below. This story continues to unfold. Red Plastic Bag is seen as one of the foremost lyricists and composers of calypso in Barbados. He has been a significant part of Crop Over and Bajan calypso/soca for over 30 years and to celebrate him is a Stefan Walcott Top 10 list of his lyrical masterpieces. This song from 2009 is one of Red Plastic Bag’s biggest hits of the last 5 years. It is simply constructed and I actually dismissed it at first until my mum said, “Listen.” What I heard was a portrayal of Crop Over that was simple, vivid and direct. My favourite line: I see vendors doing good trade, snowcone man got it made. In the calypso genre it is expected that the lyricist take a topical event and put it over in song. The more disguised yet understood the composition is, the better the calypso is considered. In this song Bag takes the escape in 1987 of convicted criminal Winston Hall to construct this more than witty composition. Note, he never mentions the event directly or Hall by his name. This song is the one most used by people to testify to Bag’s genius. My favourite line: I search every Kingdom Hall, I search every dancehall. Red Plastic Bag is self-admittedly inspired by Chakdust and like Chalkdust, he uses sickness as a metaphor in this song to get his point across. From the first line to the last puns rain down with most speaking to the topical issues of 1989, which unsurprisingly, are relevant to 2014. My favourite line(s): The body surviving but really aching bending over in pain. It needs support to stand strong again but cannot depend on this cane. This one is from 1984, the early days of Red Plastic Bag. Here Bag sings about Bim, another name given to Barbados and his love for it. He does not do this in a typical manner, instead he lists all the things wrong with it and says in spite of these, he still loves his country. Once again a simple melody and easy tempo allows every word to be heard. My favourite line(s): Some call you bad and cry you down. Certainly not me, of this soil I am a true son. This song, like others on the list, was responsible for Bag winning the national calypso competition. It is one of my favourites and here Bag takes the sobriquet’s of other calypsonians and assigns topical material to them. Composing this song involved some serious writing technique, because not only did he need to find the issues, he had to select the appropriate calypsonian which fitted the issue. My favourite line: The US show of power as the world’s liberator, that one I giving to Invader. This song is one that fits the Red Plastic Bag template; find a pun and stick with it. Here Bag plays with his own sobriquet,which to many people is a waste product. However, he pulls this metaphor into the battle calypso tradition laying a challenge to fellow calypsonians that he is back in the game. My favourite line: To environmentalist it’s really a drag, (why?) it’s hard to get rid of the plastic bag. In 1989 there was what was known as the “chicken controversy” where it was alleged a local businesswoman was selling chickens that were dead as opposed to being freshly killed for consumption. Bag here relates the event through double entendre and a soca beat. My favourite line: One worker did not chicken out, he broke the news and caused a big foul/fowl up. This one from the early period of Bag (1983) saw him play a game of riddles. Here he takes a controversial political issue and asks, who or what am I? This song of course has a built in audience participation component and it would have been a great joy to have heard it in the old vibrant tent setting. My favourite line (s): Take this easy riddle to solve you must always get involved. Scratch your head and give it a try, tell me, who or what am I? Volcano is a much quicker song than many on this list. This song is once again soca and Bag, unlike many soca artists, inserts his pun. Here he references the eruption of the volcano in Montserrat with his ability to erupt a party. Clever. Favourite line – Volcano, kicking up, soon erupt and the lava getting hot. Although not a Crop Over song, this Christmas song is a funny narrative of Plastic Bag’s partner attempting to pass off her affair as a visit from Santa Clause. Of course this is a rather dry description, just listen to Bag below as he relates it beautifully. My favourite line: Maizie where is the reindeer, Maizie I ain’t see no sleigh? Look he had no reindeer or sleigh, he came on BWIA.